When a group of guys sit around all morning with no bites the conversation always takes on a weird path. It began with me talking about how I read that fishermen were using WD-40 to catch trout. Big D who was an Ichthyologist disbelievingly said, ‘No way’. Cedric says, “Hey, I got a can of WD-40 let me go get it”. Let the games begin! Next, Big D showed me a trout dip he had in his truck that had a warning that it was flammable. The main ingredient was acetone! We both were knowingly thinking perhaps using WD-40 wasn’t all that crazy after all. Cedric had two identical rigs with green powerbait. He sprayed one with WD-40 and the other was left plain jane. Casted both baits out about 30 feet from shore with a six foot spread between them. While we waited to see what would happen I went on to say how some folks believe that the original WD-40 had fish oil in it (myth according to their website). Within 15 minutes the strike indicator flies up. We are all sort of shocked as we silently realized it’s the pole with the WD-40 that got the solid bite. Other pole nothing. Cedric put new bait on with WD-40 and in another 15 minutes the same exact thing happened! Other pole nothing – Technically all of our 5 other poles we were fishing without WD-40 had no bites during this experiment. Incredible mad science. 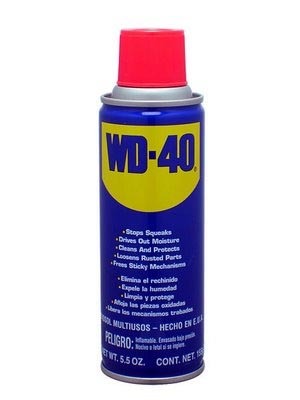 That was good enough of a test for me and Cedric to say that WD-40 does work. But it’s a bit out there. Even for us. I think we would rather be skunked than mix fishing and the smell of mineral spirits together. But it was a cool experiment and satisfying to finally resolve the myth or reality question. Hmm…. what about Preparation H? This entry was posted in Trout Fishing and tagged fishing wd40, trout wd-40, trout wd40. Bookmark the permalink. Thank you for this post. It resolved a lingering question before coffee. We fishermen are always thinking and I had always wondered if that was a myth for decades.